Ryan Steenberg '09 (medical illustration) was runner-up in the 2016 World Long Drive Championship. How does a medical illustrator become a champion at driving golf balls? The answer is part timing, mixed with a little luck and a love for training. Steenberg, who earned a bachelor’s degree in exercise science from Ithaca College, started his career as a sports strength and conditioning coach. But after a few years, he got a little bored. But he couldn’t find full-time work in the field after graduating because of the 2008 recession, so he reverted to sports performance. He opened a studio in the Rochester suburb of Brighton next to an indoor golf facility and began specializing in golf fitness. In 2011, he attended the PGA annual trade show in Orlando. He started talking to some of the long drivers there and they invited him to participate in an indoor exhibition sponsored by Krank Golf. Steenberg said he has been golfing since the age of 3 and has always had a knack for hitting the ball long distances. He won the exhibition, beating a couple of world-ranked players. That got the attention of the president of Krank Golf, and Steenberg was invited to compete for the company. Steenberg said the sport has ebbed and flowed over the past six years. 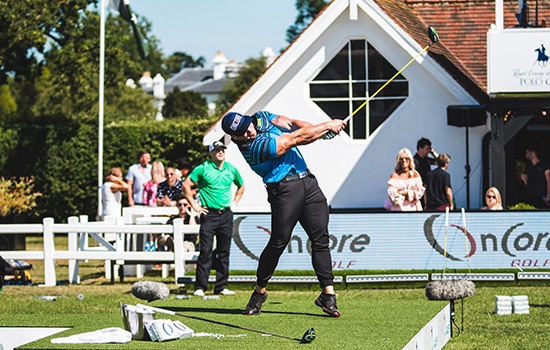 He stopped competing in 2014 and 2015 but returned in 2016 after the Golf Channel became involved with the World Long Drive competition. In October 2016, Steenberg placed as runner-up in the World Championships with a drive of 412 yards, 11 yards short of the winner. That was the catalyst, he said, for a full year of golf appearances in 2017 with two golf circuits: World Long Drive and Long Drive World Series, an international tour which launched last spring in Dubai. While there, Steenberg visited RIT Dubai and students, faculty and staff watched him compete. Steenberg will continue competing at least through the end of 2017 and running his sports performance and fitness center, 4 Performance, in Brighton. He is currently ranked seventh in the world with his longest competitive drive recorded in July at 485 yards. He also has partnered with OnCore Golf in Buffalo, N.Y., as an ambassador for their ELIXR golf ball that is being sold in Wegmans on the East Coast. Between touring, his business, training, his wife and two young children, Steenberg said that he doesn’t have much time for his artwork. He suspects when things calm down he’ll revisit it.